In 1954, in the cookhouse of a logging and sawmill settlement in northern New Hampshire, an anxious twelve-year-old boy mistakes the local constable's girlfriend for a bear. Both the twelve-year-old and his father become fugitives, forced to run from Coos County-to Boston, to southern Vermont, to Toronto-pursued by the implacable constable. Their lone protector is a fiercely libertarian logger, once a river driver, who befriends them. 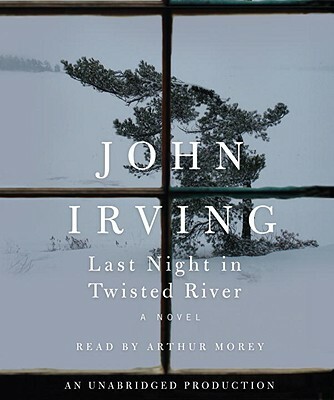 In a story spanning five decades, Last Night in Twisted River-John Irving's twelfth novel-depicts the recent half-century in the United States as "a living replica of Coos County, where lethal hatreds were generally permitted to run their course." From the novel's taut opening sentence-"The young Canadian, who could not have been more than fifteen, had hesitated too long"-to its elegiac final chapter, Last Night in Twisted River is written with the historical authenticity and emotional authority of The Cider House Rules and A Prayer for Owen Meany. It is also as violent and disturbing a story as John Irving's breakthrough bestseller, The World According to Garp. What further distinguishes Last Night in Twisted River is the author's unmistakable voice-the inimitable voice of an accomplished storyteller. Near the end of this moving novel, John Irving writes: "We don't always have a choice how we get to know one another. Sometimes, people fall into our lives cleanly-as if out of the sky, or as if there were a direct flight from Heaven to Earth-the same sudden way we lose people, who once seemed they would always be part of our lives."